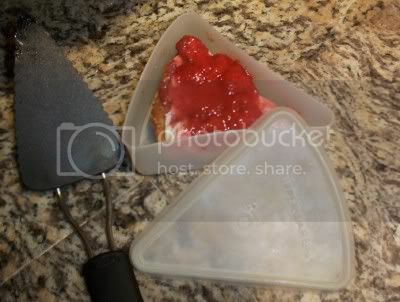 I love finding these pie slice containers--I feel like the aproned housewife of the golden age of Tupper! It saves my husband from downing too much pie at once and gives him a selection of treats for his lunch. A must for the no-flour baker: one of these flexible plastic pie servers, the only tool that lets you extract a slice without crumbling the nutty crust. Edited to add: Thanks to all the Tupperware saleswomen who have emailed with information about purchasing pie slices through your company. I do like Tupperware, but you must not have been a reader here for long or you would know I only buy it for a quarter or less. Let me know next time you're having a yard sale, though!